Here are 4 free KML to CSV converter software for Windows. 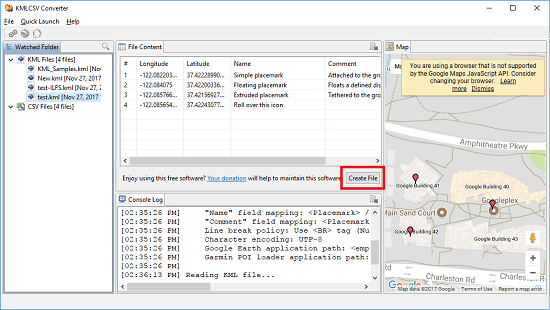 These software take a Google Earth’s KML file from you then will convert that to a CSV file in a few clicks. These software support simple and other GPS complaint CSV formats to export KML data. You can choose what CSV format suits you need and these software will help you. Some of these software allow you to specify in which column of the CSV, you want to add latitude, longitude coordinates, etc. And before actually converting the KML file, you can visualize it on the map and edit some data if you want. Some of these software work as a decent KML editor software too. If you have a KML file and you want to extract out geographical information like GPS coordinates, then you can convert that to CSV. In the CSV file, you will see the name of all the way-points and corresponding location. And these software that I have listed below will help you. You just have to select a KML file, visualize it and then finally export it to CSV. ITN Converter is a free and one of the best free KML to CSV converter for Windows. It lets you import a KML file and then you can visualize it on the map and edit some GPS location info from it. You can edit the details like latitude, longitude coordinates, name of the way points, and other information. The software supports a different type of map that you can use to visualize the KML file before converting. Also, when you are about to convert a KML file to CSV, then it will ask you on which column of the CSV you want to save latitude, longitude, etc. 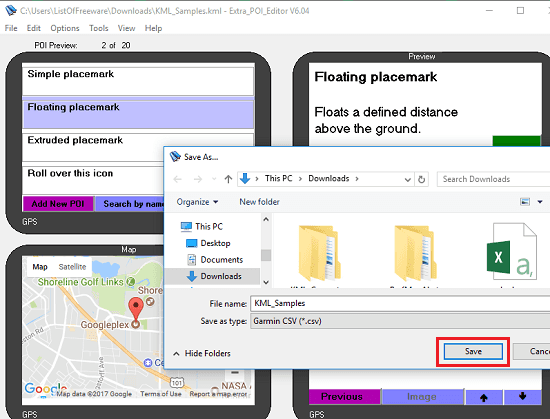 You can also go for the default layout of the CSV file in which it will save the GPS data in order. Just open the KML file in it that you want to convert to CSV. After that, it will list the latitude and longitude coordinates from that. If you wish, you can edit the file, by double clicking on anyone of them. Hit the “Editor” button if you want to see it on the map and set the map view according to your needs. Finally from the bottom of its main interface, you can choose the output format to CSV and then it asks you to specify some output parameters. You can either go for the default CSV format or you can rearrange the columns. Finally export the CSV to any folder you like. 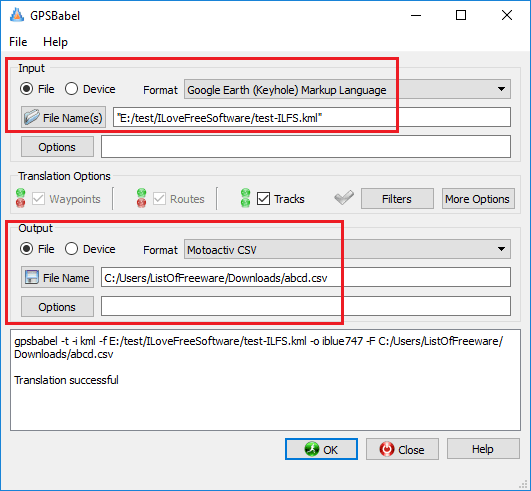 GPSBabel is kind of all in one GPS file formats converter software. It supports a large variety of GPS data file formats and can convert them to none another easily. It supports different types of CSV files corresponding to the different GPS data formats. You can convert a KML file to simple CSV, iBlue 747 CSV, iBlue 757 CSV, Mapopolis CSV, Motoactiv CSV, etc. You can convert your KML file to any of these formats in one click. However, in this software, you will not be able to visualize your KML on the map. Also, it doesn’t have an option to edit the KML file. It just focuses on the conversion part. You will find the interface of GPSBabel to be very simple. Use the input section of the software and specify the KML file that you want to convert. But before that, you will have to set “Google Earth (keyhole) Markup Language” in the input file format. After that, go to the output section in the software and then specify the output CSV type that you want the KML converted to. Finally, hit the convert button and then it will save the CSV file to the location that you will specify. It shows you the status of the conversion on the bottom side of the software. KMLCSV Converter is a simple software to convert KML to CSV. The software works in a pretty straightforward manner when it comes to converting KML files directly to CSV. It allows you edit the KML file before conversion and also you can visualize the way-points on the map that is available in the software. You will not find so many options in the software and also it can only convert the KML file to CSV in the basic formats. It exports the GPS data like longitude, latitude to CSV and in the same directory where the KML files are stored. KMLCSV Converter works in quite a different way to convert KML files to CSV. It uses a default watch folder in which you have to move the KML files that you want to convert. You can change the watch folder if you want, through the settings of the software. After moving your KML files to the watch folder, it will list them all and you can open them one by one and convert to CSV. To convert them to CSV, just select them when its data shows up, hit the “Create File”button to save the current KML file to CSV. Extra_POI_Editor is another free software to convert a KML file to CSV. This software works like the other software that I have mentioned above. It lets you explore a KML file that you can edit and visualize on the map. And when you want to export it to CSV, then you can use the various type of CSV file according to the different GPS services. It has support for Garmin CSV, N-Column CSV, 4 Column CSV, Navman CSV, Navgon CSV, and Magellan CSV. You can use any of these CSV file formats for the output. Using this software to convert a KML file to CSV is very simple. Just run the software and then open the KML file that you want to convert to CSV. After that, this tool will show the geographical information from the KML file like coordinates of the locations. You can edit the geographical information if you want. And after ensuring that every thing is good, you can start the conversion process. To convert KML file to CSV, just save the current KML as CSV and you are done. 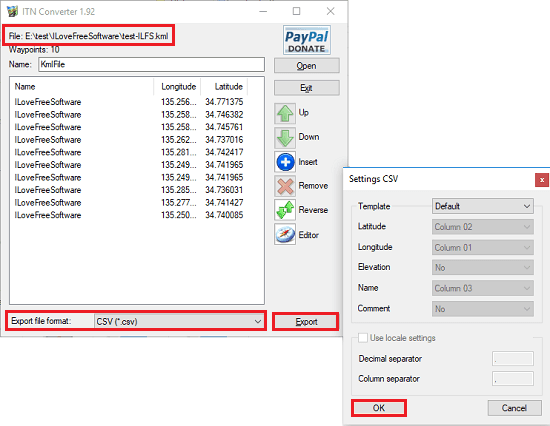 You can use any CSV format you want and save the final CSV file to any location you like. These are some of the best free KML to CSV converter software which you can use easily. You will like the various options that these software offer to give to assist the KML conversion process. From all the software that I have listed, I think ITN Converter and GPS Bebel are the best free KML to CSV converter software for Windows. And if you want to go with simpler tools, then KMLCSV Converter is a good option.